If you are running a business website on WordPress, and you have a wide network in the USA, then you must consider using an interactive USA Map plugin to provide all the information to your visitors. Recently, a new feature has been introduced in the plugin that will allow you to do bulk editing for multiple states at a time. 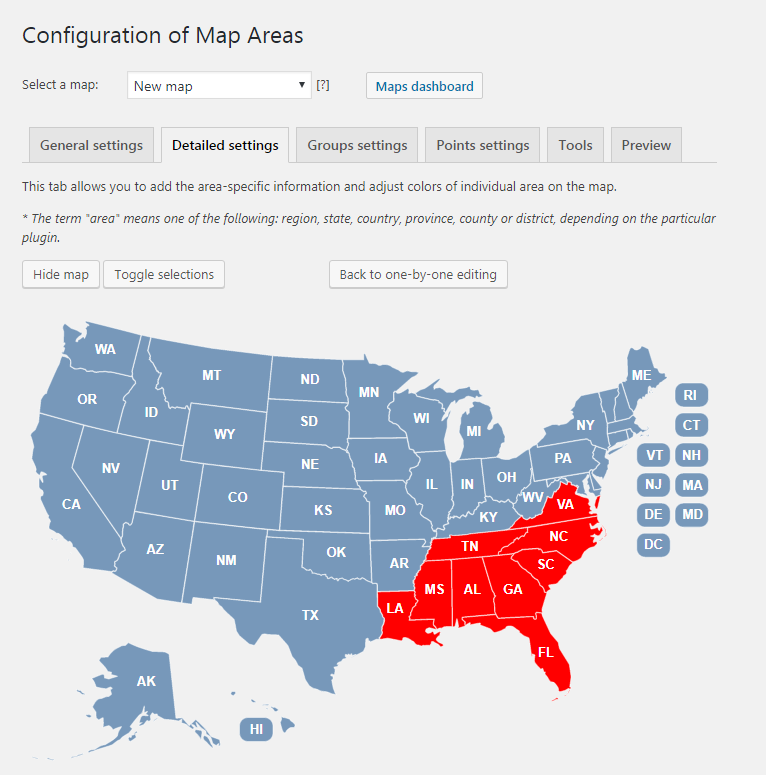 Creating sales region map with same details about multiple states can be a difficult and time-consuming task. With this specific feature, you can easily edit multiple areas at once and you don’t need to add similar information to every single state separately. 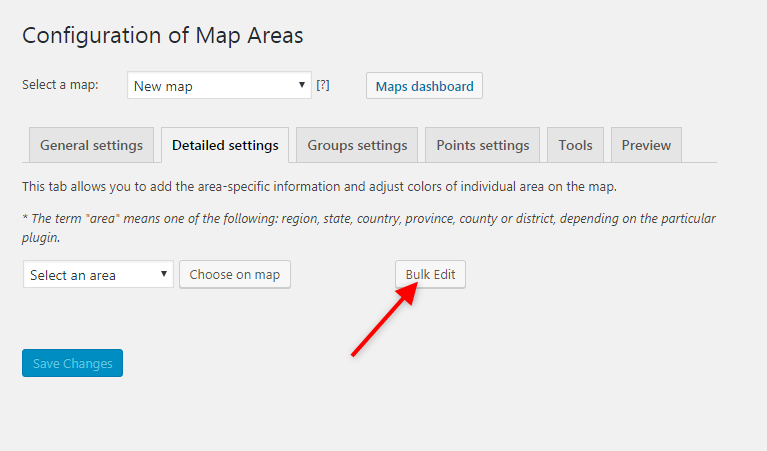 Let’s have a better look at Bulk Edit feature of USA Map Plugin. Using Bulk Edit feature of USA Map Plugin will make things a lot simpler for you. If you need to add similar settings to multiple states on a map, you can select multiple states and add the same information at once. Here are few benefits that you will be able to receive using “Bulk Edit” Feature. No need to add same information for every state separately. Add same colors to multiple states. Same settings for multiple states with a single click. Using “Bulk Edit” feature is easy and simple. 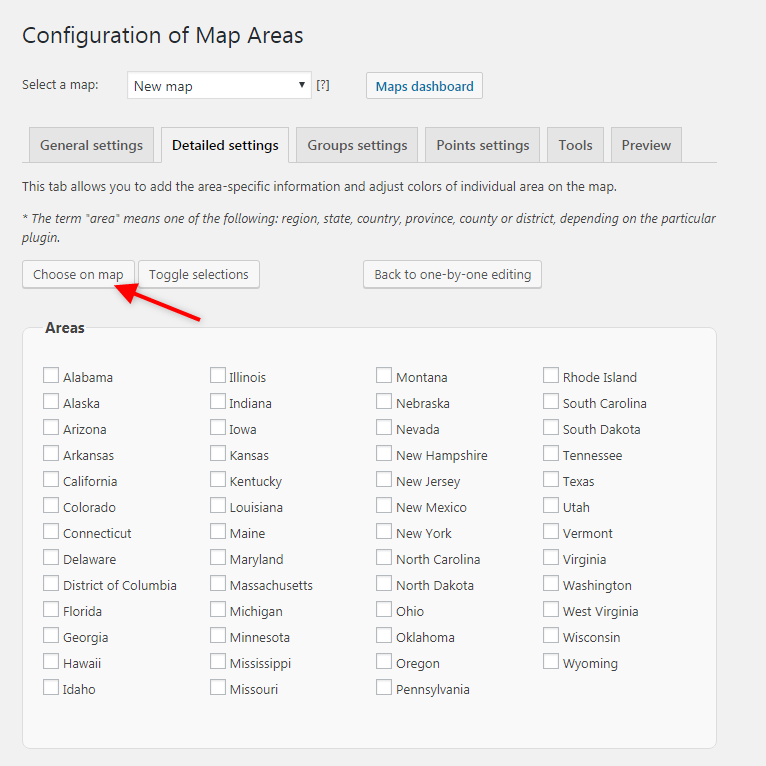 If you need to create a map and want to show the same information in multiple states, then you can simply visit the ‘Detailed Settings’ tab of that specific map to use this specific feature. Here are few steps to carefully use “Bulk Edit” feature. After visiting the detailed settings tab, you will be able to see a new option of Bulk Edit. Once you click that option, you will be able to get a list of all the states of USA and you can select the ones you need to add on the map. You can also select an option “Choose on map” to select them on the map as well. Once you have selected multiple states, you can move to the next step and start bulk editing by adding all the necessary information. You can choose colors for the states, add tooltips, and much more. After editing all the states at once, you can save changes and use the shortcode to insert the map in the desired page. 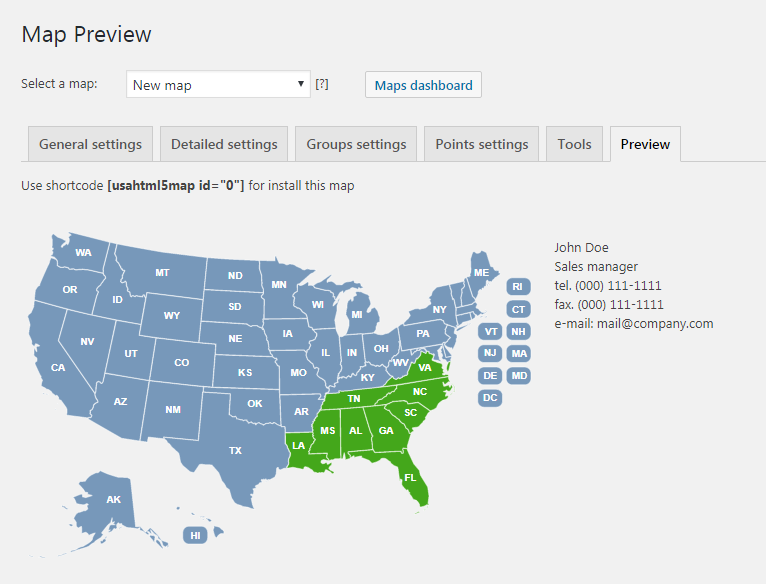 It won’t take long and it is perfect for creating sales region maps. When you are creating sales area maps on your WordPress site, it can be difficult and time-consuming to add similar information in multiple states separately. With the help of “Bulk Edit” feature, you can quickly create sales area map for your website. Usually, sales managers cover multiple states and with the older version of this plugin, it was very difficult and time-consuming to add same contact information several times. With the addition of “Bulk Edit” feature, you can edit the multiple states at once and change the settings including color, contact information, links and much more. The basic purpose of bulk editing feature is to add sales regions maps and dealer locator maps easily. With the help of this specific feature, you can create these maps within minutes. It helps you save time and improve the usability.